Although its name kind of gives itself away, Le Speakeasy on McGill Street in Old Montreal is a pretty cool place to grab a drink. Fronted by a sandwich shop, once you pass the right door, you’re transported into vast room with so many visual cues that it will take more than one visit to let it all sink in. A group of Montreal’s media dropped by last week for our first official taste of the menu and cocktails and here’s what I thought. I love the concept of a speakeasy and this is the first time I’ve ever really seen it in action in Montreal. Entering a nondescript sandwich spot on McGill, there isn’t much to see but a counter stacked with delicious looking sandwiches, a few tables and chairs, a mirrored wall and a cooler door. Once the red light goes on over the cooler door, this is where things get interesting. Passing into the cooler we step inside a cavernous bar that’s been stacked with more liquor and drinks than you can imagine. I’ve included the least amount of photography possible because you should see this for yourself. Although prohibition has been over for quite sometime, the romantic idea behind exotic hidden bars has been kept alive. 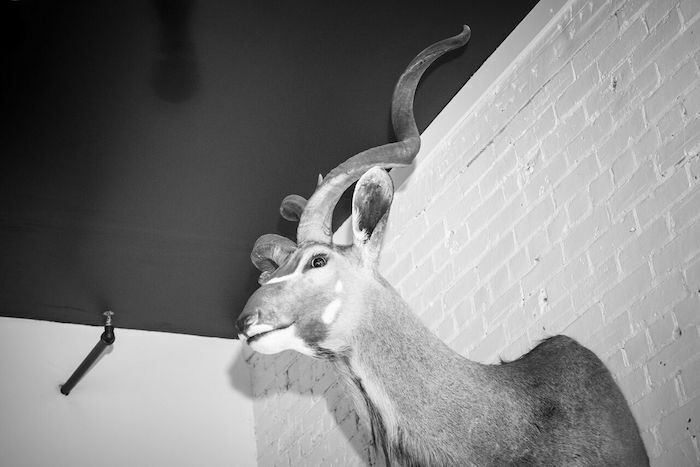 Le Speakeasy’s decor is thoroughly masculine with animal busts on the walls, dark wooden walls and leather covered chairs. The setting is delightfully moody and captivating and the place isn’t too polished. 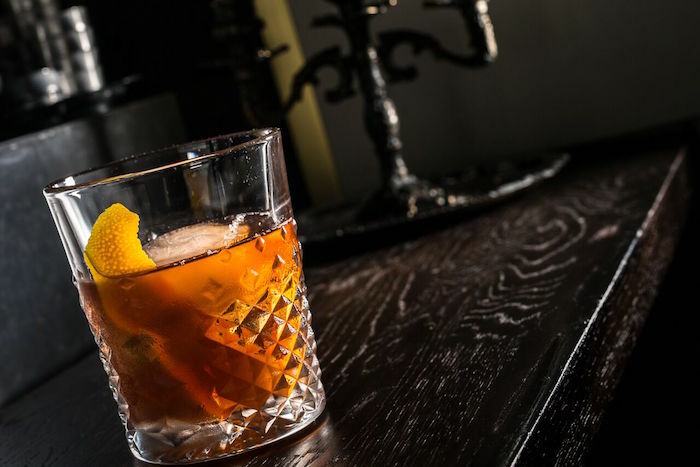 Le Speakeasy already feels lived in which actually works in its favour. 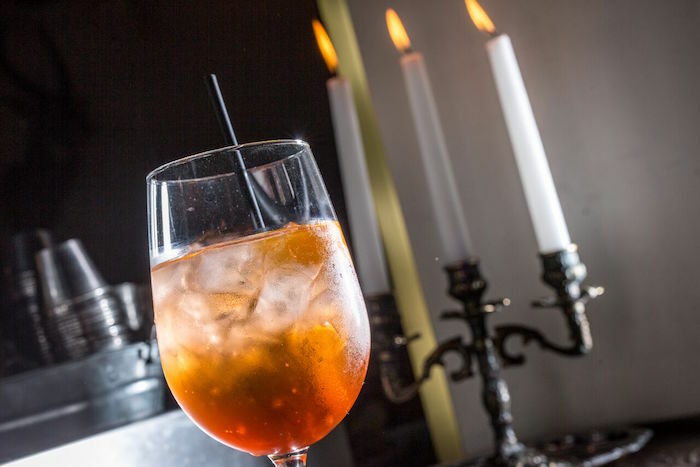 The drinks at Le Speakeasy soar above expectations. We were greeted at the door with an Aperol Spritz (the official drink of this summer IMHO) and things got deeper from there. Inside the bar I tried one of the best Old Fashioned cocktails that I’ve tasted in Montreal. We also tried the Mai Tai which was also pretty great and a couple of glasses of Prosecco. As far as bartending goes, this will be a great place to cozy up in the fall and winter months. 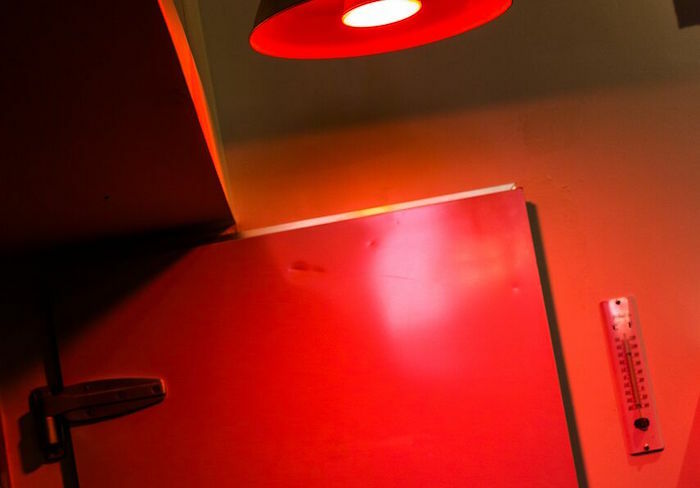 Le Speakeasy is a perfect fit for what’s just around the corner. Also, it’s never too early to think about planning those fancy December month office parties – Le Speakeasy will be perfect for this too and you’re guaranteed to impress those colleagues who don’t go out often enough. Le Speakeasy takes their concept all the way by having their menus hidden in books that are delivered to the tables. With your book in hand, turn to page 120 in your bibles and read from the menu. 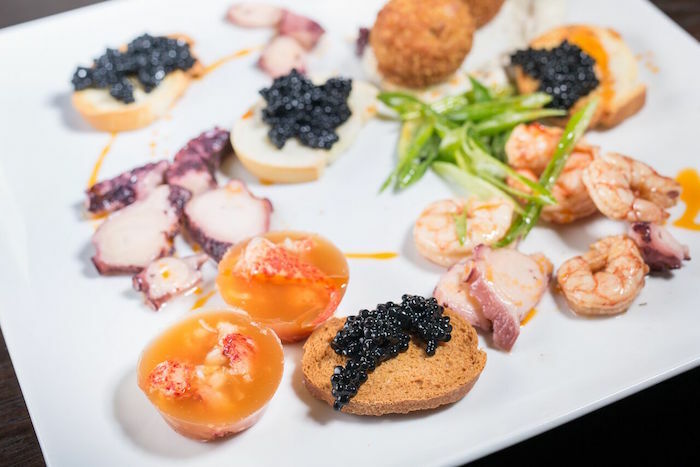 The menu is heavy on seafood and includes several ways to enjoy oysters, a seafood charcuterie plate and much more. Some dishes, like the gnocchi still need a little work but seafood lovers will delight in what they see. Things move very fast in Montreal’s bar and restaurant scene. It’s nice to have a place to slow down and enjoy an hour or two with a couple of friends and a couple of cocktails. 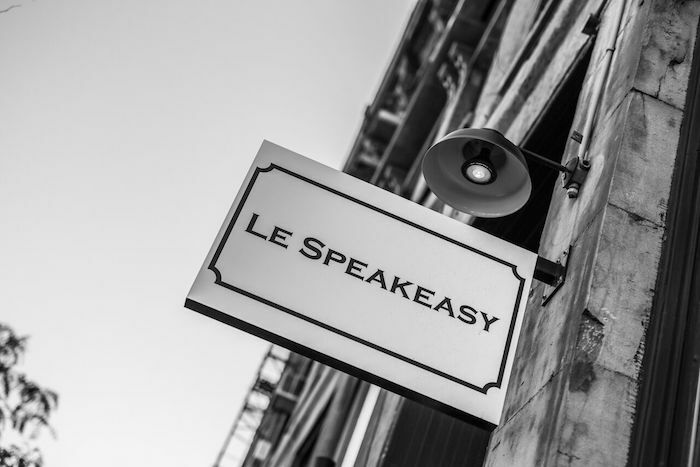 Le Speakeasy starts as a fun gimmick that has the potential to become habit forming for anyone looking for a dark corner to enjoy a drink and surprise their friends when they step through the cooler door.